Kadarbiku juices and smoothies make for an excellent ingredient or an additive in many recipes. Let us give you a few of them here, but we are always looking forward to your recipes through our Facebook page. Blend room temperature eggs and sugar into a thick foam. Add honey. Mix dry ingredients and sunflower seeds. Add the flour mixture and juice to the egg foam, alternating the two. Combine carefully, adding the oil last in a thin trickle. 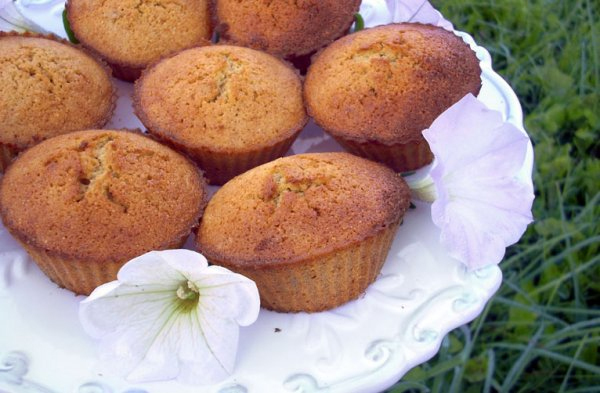 Transfer the dough into a muffin pan and bake for approximately 20 min at 180 °C. The recipe was entered in the recipe competition hosted by Kadarbiku and Toidutare. Prepare gelatine in 0.5 dl juice. Melt and cool. Mix room temperature curd cheese with the rest of the beetroot juice and cocoa powder; add melted gelatine while mixing continuously. Pour the mixture into bowls and place in the fridge. Sprinkle grated chocolate on the set dessert. 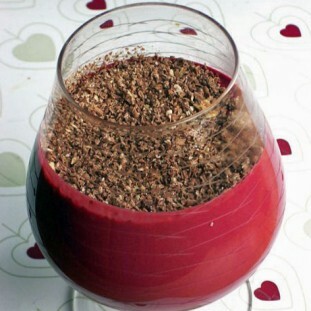 Prepare the gelatine in 1 dl of smoothie. Place chopped carrots into a pot with a lid and simmer in 50 ml water on low heat. Once the carrots are soft, let them cool. Add the rest of the smoothie, banana slices and sugar; blend everything using a stick blender. Melt and cool the gelatine and slowly add it to the mixture. Pour the mixture into bowls and place in the fridge. Blend the curd cheese paste, banana and sugar with a stick blender into a puree and place on top of the set dessert. Peel the apples and scoop into small balls using a fruit scoop. Pour lime juice over the apples and mix. Heat the mango smoothie in a pot with a thick bottom on low heat until it starts to boil. Add brown sugar and balsamic vinegar, mix. 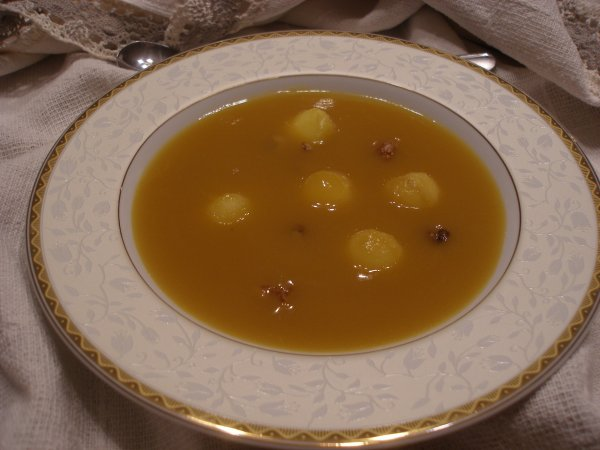 Strain away the lime juice from the apple balls; place the apple balls in the pot and boil for 2–3 minutes. Add potato starch mixed with a small amount of water, mix and heat slightly (NB! Do not boil). Cool! Finely chop the walnuts. Plate the cooled dessert on dessert plates, add the chopped walnuts. Alfalfa sprouts, fresh dill, etc. Peel and grate the carrot. Cut the cucumber into thin slivers (Julienne). Roast the pumpkin seeds on a hot dry pan for 10–20 seconds (until they start to crackle). Blend Merevaik and carrot juice into a creamy sauce using a stick blender. Place a layer of cucumber slivers in a salad bowl, add a layer of grated carrot and roasted pumpkin seeds (leave some of the pumpkin seeds for garnish). Add another layer of cucumber and lastly a layer of grated carrot. Pour the sauce over the salad. 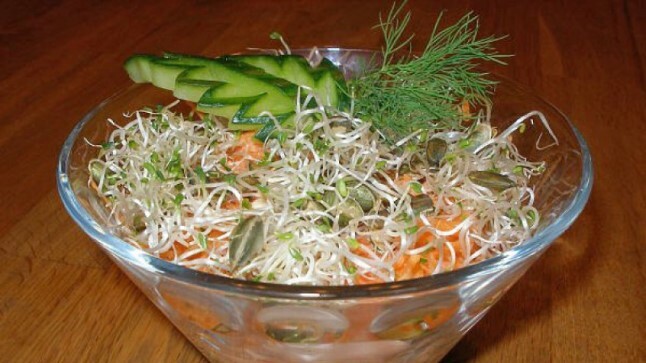 Garnish the salad with alfalfa sprouts, pumpkin seeds and a dill sprig. (I added a leaf cut from the cucumber). Serve immediately! Surprise your friends with a delightfully light and juicy salad. 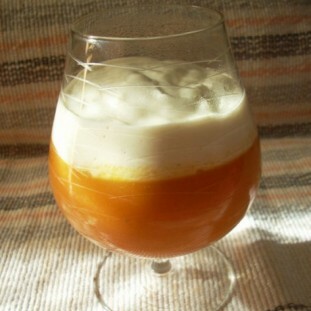 Serve with a glass of fresh carrot juice! 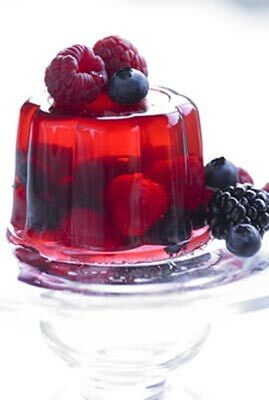 Divide the frozen berries into four bowls or goblets. Heat the smoothie to a boiling point and add the gelling sugar. Heat while mixing until the liquid is completely transparent. Remove the pot from the stovetop. Slowly pour the hot liquid over the berries and let cool. Keep in the fridge for an hour and serve with a garnish of choice. Cut the peeled eggs in half and remove the yolks. Crush the yolks, for example by pushing them through a strainer or grating finely. Add a bit of mayonnaise and enough beetroot juice to turn the yolks into a smooth pink cream. Season with salt and pepper to taste. Put a piece of salted salmon in each egg half. Transfer the coloured yolk mixture into a small pastry bag. Fill the egg halves and add four small dots to the edges of the egg for toes. The recipe is taken from Nami-Nami’s private collection. Brightly coloured beetroot-dyed eggs for the Easter table! Nami-Nami recommends trying Kadarbiku beetroot juice. Boil the eggs (e.g. in a barely boiling water for 10 minutes), quickly cool them under cold water. Season the grated beetroot with garlic, cumin, salt and lemon juice. Add dill if desired. Place the salad in a bowl. Peel the eggs and gently push them in the salad, so that they are fully submerged in the salad. Cover the bowl with a lid and put in the fridge for 12 hours to marinate/colour. Remove the eggs from the salad, gently wipe them with damp kitchen paper. Cut the eggs in half and place them in a platter decorated with herbs. Eat the beetroot salad as is. 🙂 Keeping the eggs in the beetroot marinade for longer than 24 hours is not recommended, as this will turn the yolk purple. Buy beetroot juice, season with salt. Place the boiled eggs inside the beetroot juice to colour. Eggs shown in the photo were in beetroot juice for about 2 hours. 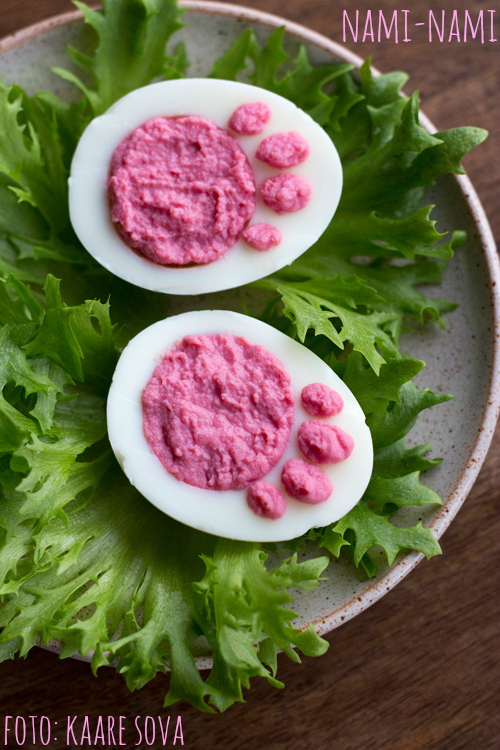 Spotty beetroot eggs that slightly differ from classic beetroot eggs are inspired by the Chinese tea eggs. Nami-Nami recommends trying Kadarbiku beetroot juice. 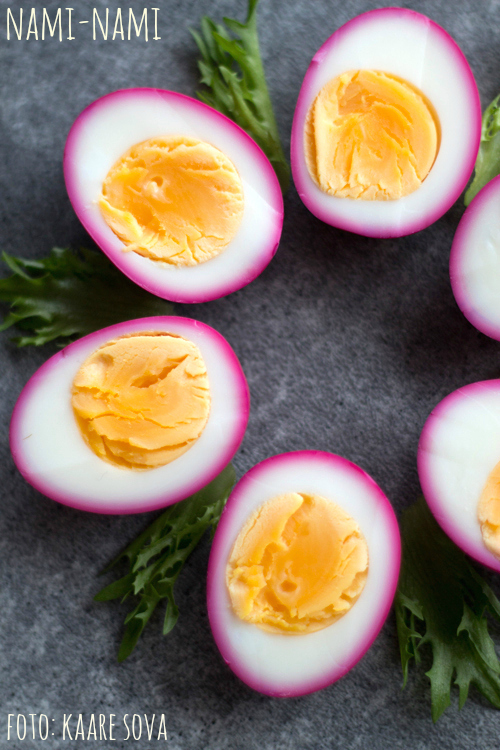 Hard-boil the eggs, cool quickly under cold running water and strain. Slightly crack the shell with a spoon or hitting them on the table. Place the eggs inside beetroot juice seasoned with salt and leave them for 1–2 hours. Remove the eggs from the beetroot juice and peel carefully. 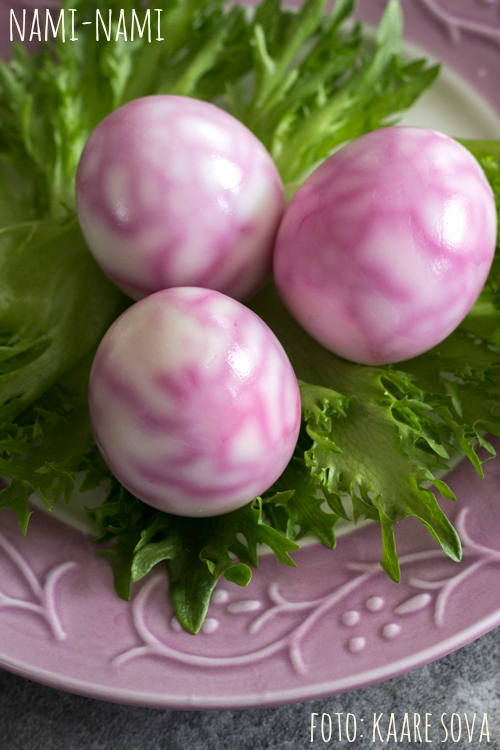 The marbled beetroot juice pattern stays on the eggs for a few hours. After a while, the colour will absorb and turn the eggs evenly light pink. You should therefore prepare beetroot eggs 1–2 hours before serving.